Friends of Friends . . .
All the following stations have friends’ groups working to enhance their stations. Some of the groups have their own websites or associated with community websites for which the links* are provided by clicking on the appropriate name. If no link is available then you can contact the groups via the Association of Community Rail Partnerships (ACoRP) or the High Peak & Hope Valley Community Rail Partnership (HPHVCRPC). We can also put you in touch. Nearby at Hadfield admire the new flower borders and planters. At Broadbottom take time to look at the flowerbeds, community art work and baskets. Hattersley offers an original art mosaic, children’s art work and new raised flower beds. Dinting - "Dinting in Ceramics" - enjoy 5 original ceramics created by High Peak Community Arts' Group - Project Earth - vulnerable adults working alongside local artist Adrian Holt. At Guide Bridge enjoy the Memorial garden on Platform One just by the Booking Office. At Whaley Bridge step into the beautifully restored waiting room with displays. Wander outside and take in the raised flower beds and the sensory garden. Enjoy Chapel en le Frith’s restored running in boards and expanding flower and herb borders. Furness Vale has a lovely station garden dedicated to one of its founders. At nearby New Mills, both Central and Newtown stations regularly receive care. 1n 2015 Friends of Buxton reformed with Dave and Sue Carlisle and team. They have now provided a variety of colourful tubs on the platform and baskets to adorn the station buildings. The iconic fan window is now floodlit in the evenings. When in Buxton visit the award winning Japanese garden situated behind the station buffer stops. Say hello to Joe a very special artistic creation on the platform! Admire the local murals depicting Buxton's history and the model inside the waiting room showing the history of Buxton's two adjoining stations. Rose Hill is a picture! Enjoy the flowers, new planters and share the pride. Marple - immerse yourself in Agatha Christie links and memorablia! Linger in Hindley’s (Wigan Line) award winning gardens and at nearby Walkden (Atherton Line), look at the flowers in the unique steel planters and platform borders. At Denton and Reddish South flowers abound on the stations for their once a week train (from Stockport to Stalybridge on Friday mornings). At Heaton Chapel take time to look at the giant Running Man mural - Manchester platform - and learn about the Heatons. And at Handforth in Cheshire you will see its name in many different forms! 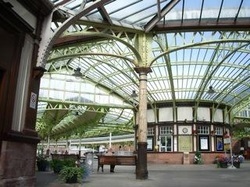 Wemyss Bay Station (right) is a masterpiece of Edwardian engineering on the Clyde coast. The Friends there are campaigning to restore and maintain the Grade-A listed building. Following a visit there by Chairman of FoGS, Neil Williams, we decided to unofficially "twin" with them. Bentham, on the Leeds to Morecambe Line, is an award winning station worth visiting! The Friends of Bentham Station led by its innovative Chairman Gerald Townson, have transformed the appearance of the station. There are now attractive flower tubs and informative storyboards enhancing the platforms. Tourist information about Bentham and surrounding places to visit can be obtained from the former station building on the Leeds bound platform. *Websites or companies shown here are selected on the basis that they are relevant to the purpose of this site. Some of the linked websites may also offer other commercial services, such as online purchases. The inclusion of any link to an external website should not be considered as an endorsement of that site or it's owners, products or services. FoGS as a group or the web builder cannot be held responsible for the content of any external website. Equally, any views expressed on an external site are those of the authors of those sites and should not be taken as representing our own views.